Chef and author Sonoko Sakai will be teaching hands-on Ramen and Soba Workshops at Sequatchie Cove Farm in Sequatchie Valley and Sewanee: The University of the South on Feb. 14-16. Valentine’s Day Ramen demonstration and dinner. Children’s Onigiri (Rice Ball) Class (5-12 years). Ms. Sakai is a cooking teacher, food writer, author and producer based in Los Angeles and Tehachapi, California. 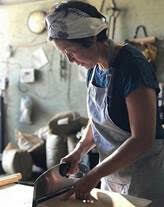 She has published two cookbooks, The Poetical Pursuit of Food: Japanese Recipes for American Cook and Rice Craft. Her third cookbook, Japanese Home Cooking: Authentic Recipes for the Everyday Cook, will be released in the Fall of 2019. Ms. Sonoko has taught at cooking schools, community centers, farmers markets, universities and other institutions around the country, including the Bread Lab at WSU, King Arthur Flour Baking School, and Anson Mills. She has also worked as producer and director for Cool Japan and other events to promote Japanese food and culture here in the United States and abroad.